Most of us enjoy a good laugh, especially at the expense of others provided no-one gets hurt. If you or anyone you know has worked at a fast food takeaway place with a drive thru then you’ll probably be aware of some of the pranks that customers get up to. From reversing a vehicle through and the passenger ordering (I’ll admit to doing this one), to collecting ice-cream cones by the ice cream instead of the cone, or pretending to breakdown at the window and having your head under the bonnet to the annoyance of the people in cars behind and the staff at the windows. These following video’s though, are a bit different and unique, we thought we’d share them with you to have a good laugh. 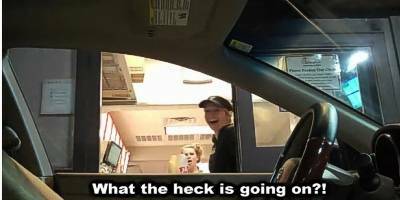 In this first video below we get to see the staff at the Mcdonalds Drive-Thru window freak out and try to work out what’s happening when a car pulls up to the window with an invisible driver! Funny ay? !… We love it! The invisible car seat costume and the guy who came up with this original idea has his own YouTube channel and goes by the username of MagicofRahat – you can check out his page and watch all of his prank video’s here – http://www.youtube.com/user/MagicofRahat. He’s actually really good at magic tricks but has become popular for coming up with some hilarious and unique drive thru pranks. So in this drive thru prank video we see Rahat fainting as he gets a static shock when handed something from the employee’s. These pranks are pretty much innocent and for us that’s what makes them funnier. So if the above has inspired you to get out there and pull some funny pranks on the poor workers at your local McDonalds or Kentucky Fried Chicken drive thru’s, don’t do anything to hurt them, come up with something creative and harmless that won’t put you in the news for all the wrong reasons..!